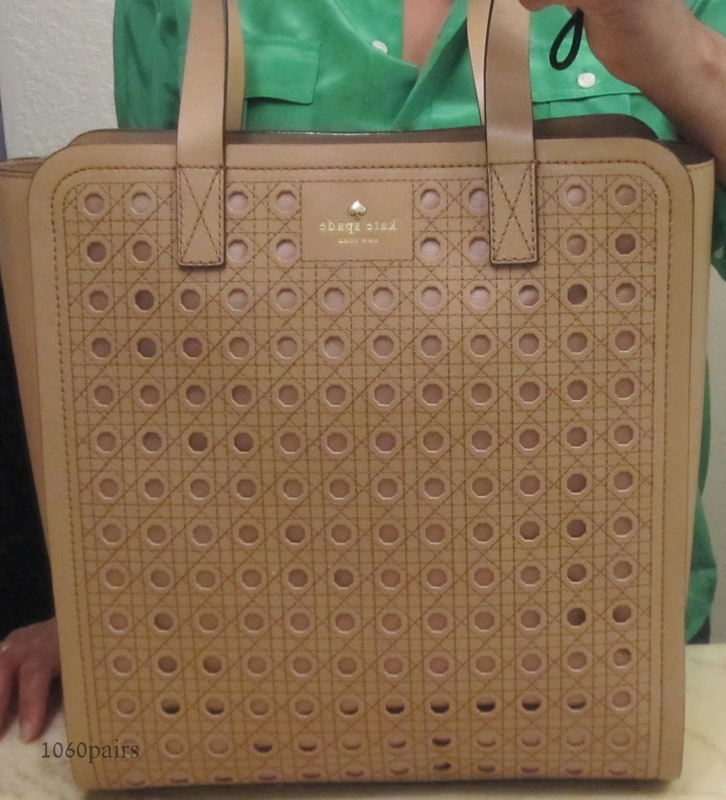 Kate Spade Patio Place Lawrence (pxru4140, $478) – now $215. I’m 5’2″, to give you an idea of scale. The material behind the perforations is fabric. I used Vectra protectant which is good on both fabric & leather. The stock pic shows 3 bottles, but you only receive one. 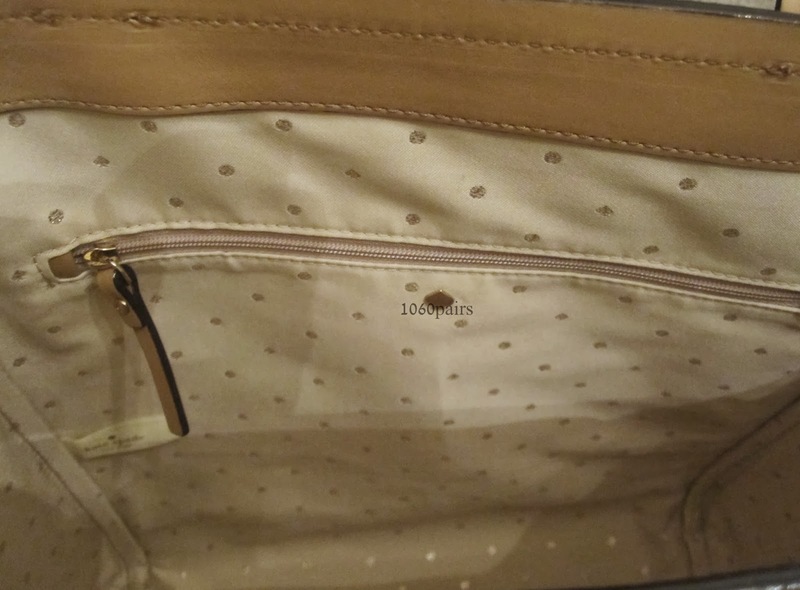 Polka dot lining. One zip pocket inside. The tote is open without any zip or magnetic closures. I’ve tried purse organizers, but everything falls out given that I carry totes. I organize with a couple of zip pouches. Kate Spade always offers an envelope type silhouette, like the Play the Field Gia ($35). I love the color, design & style. 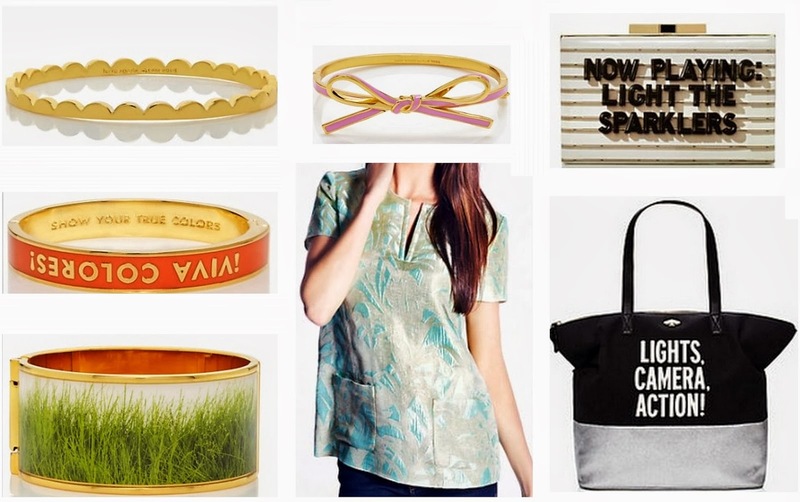 * Scallop thin bangle – I have this in white. The scallop detail is definitely noticeable when I wear a few enamel bracelets together. I love it. * Skinny mini bow bangle – Another one that plays well with others. * Cinema City Samira – I saw it at the outlet yesterday for $239. They were also having a 50% off handbag sale. There’s only a $5 shipping charge from the outlets. * True Colors idiom bracelet – I thought there was a choice of orange or pink. I saw this yesterday and half of the bracelet is orange, the other half is pink. * On Par grass bracelet – I saw this one yesterday, too. It’s part of the golf inspired collection. You wouldn’t know it if you see it solo. It looks like a pretty, nature inspired bracelet. The online price nets $55. In the outlet it was marked $98 + 40% off. My outlet has an addtl 10% off coupon, which would make it $52. 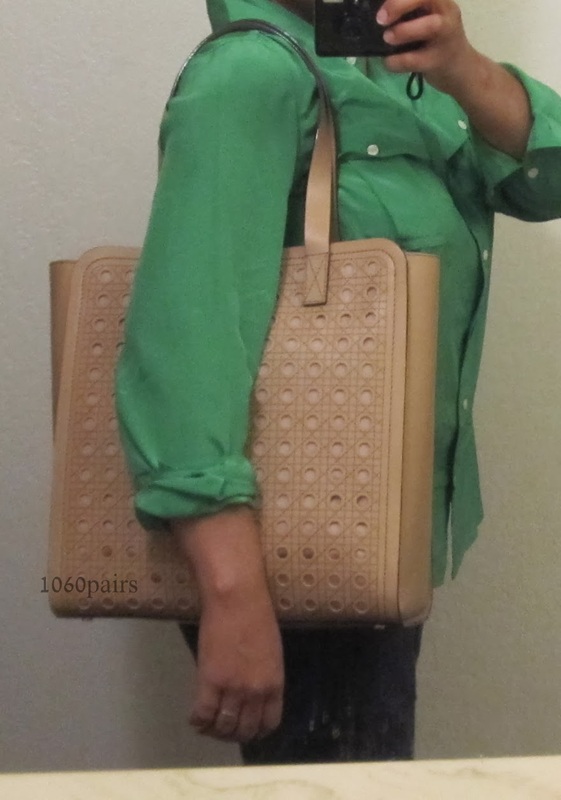 * Emmeline top – This reminds me of J Crew’s gilded brocade top. I look, but don’t usually buy KS clothing because it’s not a match for my figure. This one looks like it has flow. * Lights Camera Action Terry – Another one I saw yesterday at the outlet. It was marked $199.99 + 50% off. I’m assuming it was sent from a retail store. This film collection is new retail as of this past August, I believe. 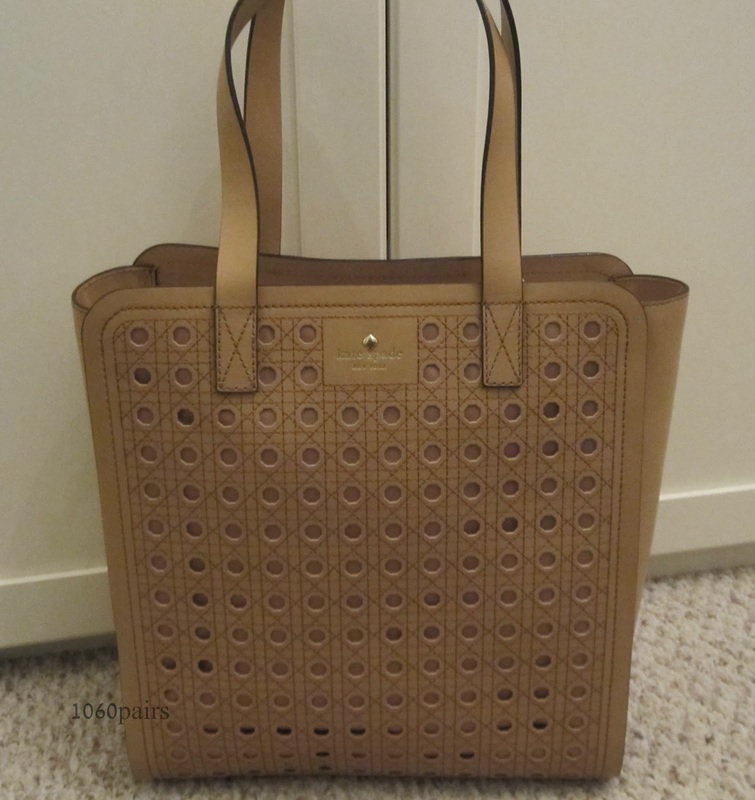 I’m not sure why I saw a couple of these at the outlet, like the Samira clutch and the Terry tote. I don’t know if you’ll find them readily available. I do know that if you call an outlet store, they will do a check for you. Also, I asked if the 10% outlet coupon can be used in addition to the promos and was told yes. I was surprised because usually when I’m at the outlet (extreme sale promo), the outlet coupon doesn’t apply. It could be a case similar to J Crew’s practice. If it’s a global promo, you can’t use an additional coupon. If it’s an item type promo — in this case handbags are 50% off & some are an additional 20% off — you can use the outlet coupon code. The coupon I’m talking about is the one that comes in the book you can get from the admin office or information office of your outlet stores. Visit their website for details. kate spade tip: If the item number begins with wkru, it’s a handbag produced for the outlet. If it begins with pxru, it’s a retail handbag. I just want to tell you that I am just newbie to blogging and seriously enjoyed you’re web-site. Almost certainly I’m likely to bookmark your blog . You actually have impressive well written articles. Bless you for revealing your blog. I just want to say I am beginner to blogging and site-building and seriously savored your blog site. Probably I’m planning to bookmark your blog . You certainly come with remarkable article content. Thanks a lot for sharing your web site. I just want to say I’m new to blogging and absolutely liked your page. Very likely I’m planning to bookmark your website . You amazingly come with incredible writings. Many thanks for sharing your blog site. I just want to tell you that I am very new to blogs and really liked you’re web site. Likely I’m likely to bookmark your blog post . You definitely have awesome articles. Cheers for sharing with us your blog. I simply want to mention I’m very new to weblog and certainly loved your page. More than likely I’m want to bookmark your site . You really come with wonderful articles and reviews. Appreciate it for sharing with us your web site. I just want to say I am very new to weblog and certainly liked your web blog. Very likely I’m going to bookmark your website . You actually come with really good articles and reviews. Appreciate it for revealing your web-site. I simply want to tell you that I am just all new to weblog and definitely savored you’re page. Probably I’m likely to bookmark your blog post . You amazingly come with perfect well written articles. Thanks a bunch for sharing your web site. I just want to say I am just very new to blogging and site-building and absolutely enjoyed this web blog. Likely I’m going to bookmark your blog . You surely have great posts. Regards for sharing with us your web page. I just want to say I’m beginner to blogging and definitely savored you’re page. More than likely I’m likely to bookmark your website . You really come with superb articles. Thanks for revealing your web site. Thank you for all your efforts on this blog. My niece delights in setting aside time for internet research and it is obvious why. Many of us know all regarding the dynamic method you give powerful techniques via this web blog and even improve contribution from some others on the article plus our favorite child is without question understanding a lot. Have fun with the remaining portion of the new year. You are carrying out a first class job. I simply want to tell you that I’m new to blogs and certainly loved this blog site. Very likely I’m going to bookmark your blog post . You absolutely come with awesome articles. With thanks for sharing your website. I just want to say I am all new to weblog and certainly enjoyed this web-site. Probably I’m likely to bookmark your blog post . You amazingly come with wonderful writings. Kudos for sharing your web-site. It is truly a nice and helpful piece of information. I’m glad that you just shared this useful info with us. Please keep us up to date like this. Thank you for sharing. An outstanding share! I have just forwarded this onto a colleague who was conducting a little research on this. And he in fact bought me lunch because I stumbled upon it for him… lol. So allow me to reword this…. Thank YOU for the meal!! But yeah, thanks for spending the time to talk about this matter here on your site. I was examining some of your blog posts on this site and I conceive this website is really instructive! Continue putting up. A fascinating discussion is definitely worth comment. I do believe that you should write more on this issue, it might not be a taboo matter but typically people do not talk about these issues. To the next! Cheers!! Howdy! This post couldn’t be written much better! Going through this post reminds me of my previous roommate! He continually kept talking about this. I will send this article to him. Fairly certain he’ll have a good read. Many thanks for sharing!